Sergei Venyavsky's report for AP on the terrorist attack yesterday at a crowded central market in Vladikavkaz, the capital of North Ossetia, is a good introduction to WABC-77 radio host John Batchelor's interview last night with Russian expert Stephen F. Cohen. The podcasts are at the WABC website; if you missed the live interview they're your only chance to obtain the most informative up-to-date analysis of Russia available to the general public. The interviews are in four 10-minute segments; the first segment (link) is at the end of the 10-11 PM podcast, after John's interview with Ann Marlowe. The rest of the segments are found on the 11 PM-midnight podcast (link). Russia's response to terrorism in the North Caucasus and the particular challenges the government faces in dealing with terrorism. President Dmitry Medvedev and Prime Minister Vladimir Putin: their political relationship and spheres of power. Will Putin go for a third term as Russia's president? Challenges to Russian federalism and modernization of the country's political system. Russia's geopolitical realities: relationship with Iran and attempts to balance the relationship with the U.S. relationship. Russia's weapons sales to Iran and work on the Iran's Bushehr nuclear reactor. Russia's rapprochement with Germany; Germany's preeminent position in the European Union, and the impact of the Russo-German relationship on the EU. > The name of the oil pipeline that Dr Cohen couldn't clearly remember is Nabucco; yes, named after the opera, and what an opera it turned out to be. Reference the discussion. > The opening discussion about the terrorist attack in Vladikavkaz is misleading if you assume it's the first such attack in the city or the region. See the AP report for details on earlier attacks. The point Dr Cohen wanted to emphasize is that the latest attack is a troubling sign that Islamic/separatist terrorism is growing in an Orthodox Christian region. Stephen F. Cohen is far and away the most original, creative, informed, and insightful observer writing on Russian affairs today. A pioneering historian and a fine political scientist and journalist with a tireless commitment to ferreting out elusive evidence, Cohen has had extensive, first-hand experience in both Soviet and post-Soviet Russia, close contacts among contemporary Russian leaders, and a unique following among Russian intellectuals. Known for his bold, independent, passionately held, and often provocative ideas, he is respected even by many who strongly disagree with him. Cohen writes with clarity, elegance, and power. Rabinowitch's comments were his introduction to Dr Cohen's book, Soviet Fates and Lost Alternatives: From Stalinism to the New Cold War. Steve Cohen has been a guest on several different news shows over the years but in my view his appearances on John Batchelor's show are special. What sets the Cohen-Batchelor interviews apart is that the men are old friends who've been talking on the radio together for years about Russia and that John, unlike other mainstream American news analysts, is very knowledgeable about Russia, Central Asia, and Europe. The result is always an illuminating discussion shorn of superfluous questions, during which Dr Cohen's personality shines through. Praise about his literary and scholarly achievements never mentions that he was born and raised in Kentucky, which explains the hint of a southern drawl in his Manhattan accent and the wry common sense leavening his scholarly opinions. John Batchelor's listeners are very fortunate to have the benefit of Dr Cohen's scholarship brought to them, for free, on what is arguably the best daily news show in the world. Over the decades the tendency in Washington has been to listen to Dr Cohen's advice on Russia too late to avert very costly and tragic miscalculations; I hope that this time it will be different. Joseph Stalin's reign of terror in the Soviet Union has been called "the other holocaust." Over the course of 24 years, more innocent men, women, and children perished than died in Hitler's murder of European Jews. 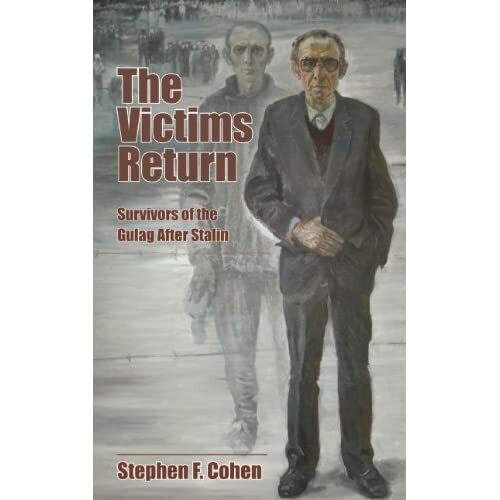 This book originated 30 years ago when Stephen F. Cohen, a professor of Russian studies and history at New York University, first began researching the lives of those victims released after Stalin's death. There was precious little information available, and many of the victims were still afraid, but Cohen persisted and through the years accumulated the remarkable stories of their return to society. Just obtaining the photograph for the cover of the book, which shows a survivor before he was placed in the gulag and what he looked like after leaving, proved difficult. The next Batchelor-Cohen interview, not yet scheduled, will discuss the book.